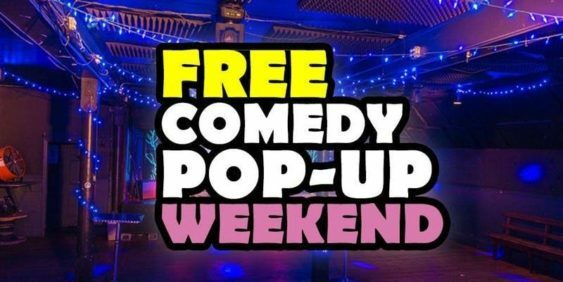 HellaFunny and Funcheap are taking over the Neck of the Woods and turning it into a secret pop-up comedy club for one weekend. Come enjoy some big laughs with some of SF’s best comedians. Comedians from this show have been seen on NBC, ABC, Viceland, MTV, Netflix, Cobb’s, SF Sketchfest, Clusterfest and more. Get Tickets – Free with RSVP (otherwise, it’s $10 at door) – Donations are appreciated. If you have the means, help support the show. Two shows each night – Friday (8pm or 10pm), and Saturday (7:30pm or 9:30pm). General Admission tickets at the door are $10, but you’ll get on our exclusive guest list on Eventbrite. There’s just 200 tickets per show. HellaFunny Comedy Night is produced by Bay Area Comedy Collective #HellaFunny. #HellaFunny produces comedy shows throughout the Bay Area 7 nights a week in venues including Cobbs, Punchline, the Great Star Theater, Milk Bar, Starline Social Club, Slate Bar, Eastside West, the Neck of the Woods and more. Comedian and CEO of #HellaFunny, Stroy Moyd, is 10-year veteran and has been seen on Tech Crunch, Vox, Complex News, Good Morning America, NBC Nightly News and Viceland.